Illustrations shown above and the statements on this page are displayed soley to explain "Colour Vision" more simply. The science behind Colour Vision is much more complicated than what is explained on this page. Colours consists of three elements -Chroma, Value and Hue. 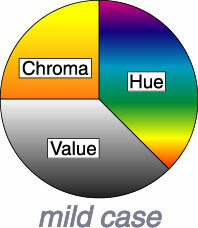 As you can see in the illustration below, Hue is the most important element regarding perception of colours. 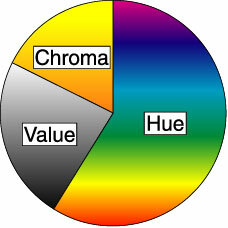 Out of the three elements that cause perception of "colour," the ratio of chroma and value are higher than the ratio of hue. 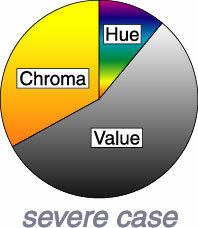 As shown above,the hue ration diminishes in the illustration. Colour perception relies more on "value(brightness)," and distinguishing colours become more difficult. "Colour Vision," or "Sensitivity to lights wave length" differs by individual. Each person perceives colours differently.